It is not possible, is it, for the Showy Stonecrop to be blooming now? These are fall flowers aren't they? It isn't fall, is it? It's still summer. I'm ignoring the signs that summer is waning and fall is gaining, signs like shorter days and school buses always in my way on my drive to work. I still have bags of mulch to spread. My garden is still giving me fresh vegetables, and I still haven't gotten a ripe tomato from the 'Aunt Anna' variety. I can't believe that Showy Stonecrop's botanical name has been change from Sedum spectabile to Hylotelephium spectabile. What's the story behind that? What kind of name is Hylotelephium anyway? The most common variety of Hylotelephium spectabile seems to be Autumn Joy. But Autumn Joy is a trade name. The real variety name is 'Herbstfreude'. I'm not sure if the ones I have are 'Herbsfreude' or another variety because they are passalongs. I just call them all Autumn Joy. Herbstfreude sounds like the name of a colleague of Dr. Hortfreud, my gardening therapist. Perhaps one of them could help me with this denial problem I seem to have as I watch summer slowly disappear into the blooms of the Witch's Moneybag, another common name for Shony Stonecrop. Ain't just a river in Egypt. Don't forget about the many sunflowers out there, the goldenrod soon to come on, the aster just now unfolding.... SIGH. I'll try to keep from doing a happy dance about the advent of fall ... oops, there go my feet! I hope fall comes late to Indianapolis and early to Katy! I'm confused by my "Autumn Joy' Sedum also....it bloomed all spring, I cut those back & now it's blooming again. But we have had such bizarre weather so far this growing season all plants & humans are confused......a 2 week spell of 90 degrees in May, then for the last 2 months, not a day over 85 with nights down to 60.....summer must be just around the corner, but then again, I noticed Liquidambers & Ginkgo's with the first flush of fall color! My 'Herbstfreude'/Autumn Joy is blooming too, Carol. I'm sorry that fall is already on your doorstep when you haven't had much of a summer. We must have gotten all of yours plus ours this year. I'm right with you on this...summer is just getting going! Isn't it?? When it is still dark at 6:30am you know fall is pulling its veil over summer. First it was the Clare Curtis Mums that bloomed early in my garden, then the Rose of Sharon and now the Autumn Joy. We had a very early Spring and it seems that we're having an early Fall as well. It's been a record-breaking season to say the least. I am in denial as well. My garden is at my weekend house (in a condo all week) and is seemed every weekend it wsa raining, had just rained, or was going to rain. Unfortunately, all this rain meant a lot of grass. As my 3/4 of an acre was all lawn when we bought, and due to my denial of the need for a riding lawnmower (why buy one when the grass will be all dug up anyway), there was always 4 hours of lawncutting. Not much time to do anything else. Now that it is hotter and drier, I am ready for summer to start! It's coming, you can deny it but it is just around the corner. 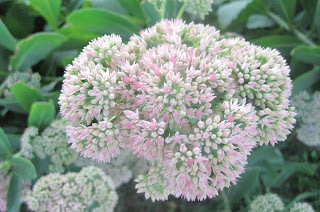 Our Autumn Joy sedum is beginning to bloom as well. I am noticing that many things are blooming a little early due to the cool weather we've had here. Carol - I'm right there with you in de-nial. But we can justifiably do that here since it will be 102 or 103 today! Hey - did you know that your Herbtsfreude is a German name and literally means Fall Happiness? How appropriate for your post! I just noticed that ours are beginning to bloom too. My garden & I are so ready for fall. No denial here. I'm in denial too. At least I did get all my annuals planted before summer came! But I'm not ready for fall. I need to plant my winter salad crop NOW and I'm still trying to get the weeds out of the Petite Prairie. Geez. And the winter squash is ready to be picked. I guess pretty soon I'll even have to get out the comforter for the bed. I was pretty chilly this morning. Ah yes, we may not have had a summer yet in the UK, but it smells of autumn in the mornings already. 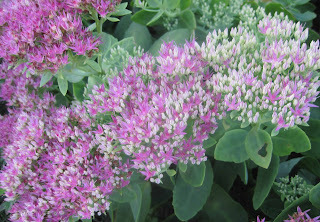 My sedum is beginning to blush as well. I see plenty of sedum in bud around here, but not in bloom. I am still enjoying phlox and lilies here, so my denial is going even stronger than yours! Yes, Carol, the "summer-killers" are starting to make themselves known. Sweet Autumn clematis is just starting to bloom in my yard and I'm not even going to go look at the anemones and see what they're doing. And I have just seen the first tomato seedlings come up in their little pots. Tomorrow is my big tomato planting day! It's still a bit early and I will have to keep them warm at night.